Royal DSM, the global Life Sciences and Materials Sciences Company, today inaugurated its Solar Technologies Demonstration Center at its DSM Engineering Plastics facility in Pune, India. This state-of-the-art solar technology center has been built to demonstrate and showcase the performance of DSM's innovations in solar technology and will also reduce the plant’s CO2 footprint by using the renewable energy generated by the solar plant to meet 25% of the site’s electricity needs. Technology for solar energy will play a central role in a more renewable energy balance of the future – a role that will become even more critical and valuable as the technology becomes more efficient and competitive. DSM aims to help enable the penetration of solar energy by focusing on the development and commercialization of technologies and materials solutions that increase the efficiency and yield of solar modules, thereby increasing the energy generation and reducing the cost of solar electricity. 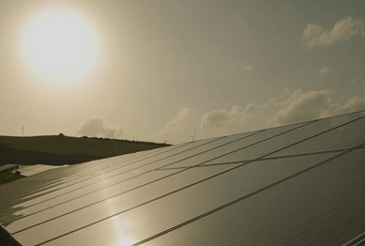 KhepriCoat®, an anti-reflective coating developed by DSM Advanced Surfaces, significantly increases the efficiency of solar panels by enabling more light to enter a solar device. At the demonstration center, the coating is successfully applied to panels of different makes and models, validating its performance for the solar industry. The center will also test a new light trapping technology which DSM is developing, which gives solar panels a performance boost utilizing smart 3D structures in a thin plastic foil. “The inauguration of the solar energy plant in Pune marks a milestone for DSM. This is a great example of how we continuously work towards achieving our ambitious sustainability targets, and, set important benchmarks in lowering our own environmental footprint. This is an excellent opportunity to encourage the use of sustainable Clean & Green Power and help support the ‘reenergizing’ of our environment,” said, Bharath Sesha, President, DSM India. We have exactly the same drive behind our market positioning in engineering plastics; our innovation efforts are also focused on sustainable development,” said Roelof Westerbeek, President DSM Engineering Plastics. DSM’s 24,500 employees deliver annual net sales of around €10 billion. The company is listed on NYSE Euronext. More information can be found at www.dsm.com.